I’ve always been a bit of a picnic grouch (I’m also a lot of a going out to brunch grouch, if anyone is wondering). Instead of enjoying a beautiful setting, I often can’t stop thinking about how much better the food would be if we had a kitchen to prepare and heat things. (And of course there is the issue of bugs, though that situation has vastly improved since I moved to California). I just don’t get that excited about cold or room temperature foods–maybe it’s their congealed texture, or maybe I’m just a terrible person, but for a long time I struggled to find a prepared dish I loved, which would still taste great at a potluck or picnic. I have finally settled on a dish I like better at cool temperatures than fresh off the stovetop. This simple salad is good just after cooking, but it seems to me that some sort of magic happens both with the combination of ingredients and cooling. The beans taste sweeter, the texture of the potatoes improves, and it makes a great salad that is substantial enough for a meal (or a double-carb nightmare, to certain people). I usually make pesto in large batches when I harvest basil from my herb bed, or find a good deal on basil. It keeps fairly well in the freezer, I add a thin layer of olive oil on top to prevent oxidation. I generally use walnuts instead of pine nuts–they are much cheaper and not likely to run into problems with rancidity or pine nut mouth. While I haven’t experienced the horror of having a metallic taste in my mouth for weeks, I have found that almost all of the pine nuts I’ve purchased in the US have some rancidity to them. Pesto, it's time for your close-up. Wash basil thoroughly and pluck all leaves from stems. Process basil, toasted walnuts, garlic, and cheese until very finely chopped in food processor. Slowly stir in olive oil, without using the processor. I’ve read that high speed blades on food processors/blenders can cause extra virgin olive oil to become bitter. As a skeptic, I chose not to believe it until I experienced it, and I have. Add only as much oil as the mixture will absorb and become a smooth, fluid paste–this may be a bit less or a bit more than the 1/3 cup recommended. Start a large pot of water boiling and add at least a tablespoon of salt. While water is coming to a boil cut the potatoes into 1/4 inch rounds. If your potatoes are much larger than a dollar coin, cut the rounds in half or quarters, depending on the size. Add pasta to boiling, salted water and set timer for the pasta cooking time. When water returns to a boil, in about a minute, add the potatoes. Cut the green beans into bite-sized lengths while everything is boiling. When there are 4 minutes left on the timer add the beans to the pot. Place about 3/4 cup pesto on the bottom of a large bowl. When the timer goes off, test pasta and potatoes. The pasta should be quite firm, but will be the perfect texture after standing. Drain, reserving some of the pasta water. Loosen the pesto with a small amount of the pasta water, just enough to ensure the cheese is melted and the sauce can coat the noodles. Add pasta, potatoes, and beans to the large bowl, adding an additional 1/2 cup of pesto to the top. 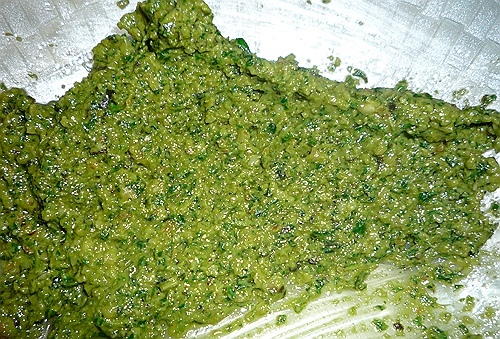 Mix, sliding a spatula down the sides, through the pesto mixture on the bottom several times. 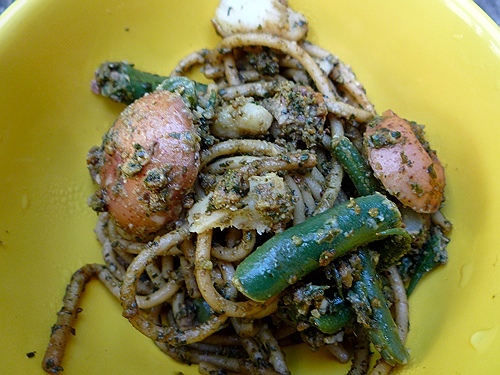 If the pasta is not coated with pesto add a bit more until all strands are coated. Taste, and if undersalted add some more Parmigian0-Reggiano or salt. Eat some now, then see if you agree with me about it sweetening up (in a good way) after cooling.